It’s that time of the year for you to start your DIY projects. The first thing on the list is painting. You want to do something different than just splash the walls. 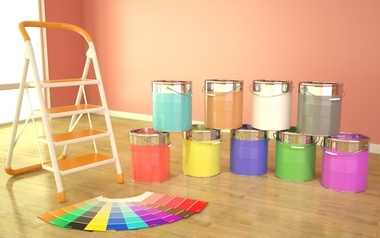 There are many fixtures and objects in the home that can be jazzed up with paint. Just look around — you can pick almost anything. But not all paints are the same and neither are all surfaces. Prepare before you start dipping the brush into the paint can. #1: Concrete: Concrete is a surface that is often overlooked when it comes to painting. But don’t count it out! Concrete walls and floors can be painted. Painting concrete does require a few more steps than your average paint job. However, the job is easy to do and inexpensive. Before painting concrete, the surface must be clean and completely dry. When working on floors they must be sanded and primed. It is best to use floor, acrylic or epoxy paint to cover the surface. #2: Metal: When painting metal, you want to make sure that all rust has been removed. If necessary, rust can be removed using sandpaper or a wire brush. Next, prime the metal; it helps protect the surface and provides a good base. Use paint with rust inhibitors or spray paint to coat the surface. Multiple layers will need to be applied. A layer of gloss or satin is generally applied last if you want a shiny finish. #3: Wood: Wood is one of the easiest surfaces to paint. Wood is extremely absorbent and will easily soak up paint. Clean the surface and remove any buildup first. It is best to sand any rough or jagged areas before continuing. A primer can be applied but is not required. It is most common to use an eggshell paint instead of semigloss on interior wood surfaces. Eggshell is more durable and has a slight sheen. #4: Drywall: Drywall must be clean and smooth before painting. Otherwise, it should be sanded. Primers are not required but are recommended. Latex, high-sheen and satin finishes are more commonly used on drywall. Each paint type offers a different finish, so which one you choose will depend on the area or room you are painting and the effect that you are going for. #5: Tile: Painting tile can be fun. Tile can be very glossy and resistant to most common paints like latex. The tile must be cleaned with sugar soap and white spirit to remove soap scum. It is important that you use a special glass or tile paint. Otherwise, the paint may slide right off. Almost anything can be painted! However, there are a few places that you may want to leave off the list. Kitchen sinks and countertops are not the best places to paint. The consistent moisture doesn’t make these areas a good canvas. This goes for the bathtub as well. Some surfaces may require special chemicals, so leave them to the professionals.